I was trained in Speleology in 1967 by Dr. David Lee of the University of the West Indies, Jamaica. I have explored and studied caves in Jamaica, the United States (with the Southern California Grotto of the National Speleological Society), Italy (the Speleological Society of Rome), South Korea, France (the Hautes d'Seine Speleo Club), Saudi Arabia, Mexico (Grupo Zotz) and Cuba. My membership in the National Speleological Society (USA) dates from 1970. In 1983, together with my wife and Dr. David Peters (Biologist) I discovered Dahl Sultan, Saudi Arabia's largest cave, the first known to contain speleothems. We spent considerable time mapping and photographing this cave. In 1985 my wife and I founded Grupo Espeleológico Zotz, the only Speleological organization in Western Mexico. This organization is dedicated to cave exploration and conservation as well as the training of speleologists. From this date I also assumed editorship of Subterráneo, the only bilingual Speleological publication in the Americas. In this respect, I attended conferences (MEXSPELEO and FEALC) in Mexico and Cuba and presented numerous slide lectures for the University of Guadalajara, the Guadalajara Planetarium, the Autonomous University of Guadalajara and the Medical Research center (among others). With the encouragement of Dr. Merlin Tuttle, founder of Bat Conservation International, Austin, Texas, we began various studies related to bat conservation and vampire bats in Mexico, resulting in my article on the protection of Mexican bats in the NSS News (see ARTICLES below). Because of this article, I was asked by the Carlsbad Caverns Association to address various U.S. governmental agencies related to wildlife and conservation, on August 23, 1994 at a special conference organized for this purpose only. This conference helped to bring about positive changes in U.S. and Mexican policies regarding bat conservation and vampire control. Upon arrival in Riyadh in 1994, my wife and I organized an international group of experienced cave explorers (all members of the U.S. National Speleological Society) and began training of several inexperienced cave explorers (including people from Saudi Arabia, France, Australia, Scotland, etc.). With this group we have continued studies of Dahl Sultan, discovered The Whistling Teapot and surveyed Shawiah Cave. Reports on these activities were presented to the Riyadh Natural History Society on several occasions and appear in The Desert Rambler (see ARTICLES below). From 1996 to 1998 I taught English to all the geologists at the Guadalajara, Mexico headquarters of Cominco Mining Company of Canada and assisted in the proofreading of geological reports. During this same period my wife and I translated two technical manuals for geologists into Spanish: Applied Reflectance Spectroscopy by Phoebe L. Hauff and Reference Manual for Pimaview by Integrated Spectronics of Australia. In November, 1998, we moved to Jeddah, where I taught English for Raytheon. At the same time, we led and participated in numerous expeditions to new caves found in the Ma'aqala, Shawiah, Majma'ah and and Haradh areas. We also founded and continue to maintain a Web Page (see below) on Saudi Arabian caves. In October, 2000, I was hired by the Saudi Geological Survey to train geologists in cave exploration techniques and to assist in the survey, study and evaluation of Saudi Arabia’s caves. English classes were also included to help the younger geologists prepare for report writing. Over a period of four years, I made approximately 50 expeditions to almost every part of Saudi Arabia with the SGS. Significant discoveries include the Caves of Habikah just south of the border with Iraq, the Caves of Munbateh, whose active blowholes suggest a huge cave system below, and the discovery of the first lava-tube caves to be described and mapped in Saudi Arabia. In addition, we have located numerous artifacts, mummies and skulls of considerable age and importance. In 2007 I participated in the study and mapping of caves near Sakaka in northern Saudi Arabia and in the discovery of the Umm Jirsan Cave System in Harrat Khaybar, the longest lava cave on the Arabian Peninsula. Major discoveries, including cave maps and descriptions are listed under Book and Reports below. Director of WordPerfect Training in western Mexico for Dinamia Corporation, Guadalajara, Mexico (1989 to 1992). Courses (including teacher training) and consulting for numerous firms and organizations. Supervisor and Administrator of Mail Boxes Etc., Guadalajara (1991 to 1994). West Coast Representative of Dr. Caleb Gattegno, The Silent Way and Educational Solutions Inc., operating out of San Rafael, California (1971-73). Director of Studies, Foreign Language Institute, Yonsei University, Seoul Korea (1973-75). Teacher, Institute of North American Studies, Binational Center, Barcelona Spain (1976, 1977). Director, TESL Media Center, English Dept., UCLA, California (1978-79). Teacher, English Language Study Group, Paris France (1979-81). Lecturer, University of Petroleum and Minerals, Dhahran, Saudi Arabia (1981-85). Director and EFL teacher for ACE, Guadalajara, 1985-1992. Professor of English, ITESM Guadalajara (1993-94). English instructor, Institute for Public Administration, Riyadh, Saudi Arabia (1994-1995). Director of English program for Cominco Ltd Mining Company, Guadalajara, Mexico (1996-1998). English Instructor, Raytheon Corporation, SALTS, Jeddah, Saudi Arabia (1998-2000). Occasional English classes taught while acting as Consultant to Saudi Geological Survey, 2000-2007. Private tutoring in Pinar de la Venta, Zapopan, Jalisco, Mexico 2007 to present. I have conducted workshops and seminars for language teachers in many countries, including: U.S. Peace Corps, Korea; Language Teaching Research Center, Seoul, Korea; University of Southern California; World Trade Center, Rotterdam, Netherlands; Didasco, Osaka, Japan; Pilgrims Language Courses, Canterbury, England; ACREA, Paris, France; Americahaus, Stuttgart, Germany; University of Guadalajara, Mexico. Outdoors in Western Mexico by John and Susy Pint, Quadrimag S.A. de C.V., Guadalajara, 2011, 210 p.
Rutas y Destinos de Fin de Semana Cerca de Guadalajara, por John y Susy Pint, Casa San Matias, Guadalajara, 2010, 200 p.
Proceedings of the X, XI, and XII International Symposia on Vulcanospeleology, edited by Ramón Espinasa and John Pint., The Association for Mexican Cave Studies, Austin, 2008. 305 pages plus CD. Al Aire Libre en las cercanías de Guadalajara by John y Susy Pint, Editorial Agata, Guadalajara, 2007, 200 p.
Ghar al Hibashi Harrat Nawasif/Al Buqum, Kingdom of Saudi Arabia by J.J. Pint et al, SGS-OF-2004-12, Saudi Geological Survey, Jeddah, Saudi Arabia, 2005, 68 p. 43 figs, 1 table., 2 apps., 1 plate. The Desert Caves of Saudi Arabia by John Pint, Stacey International, London, 2003, 120 pp. Preliminary Survey for Caves in the Habakah Region of the Kingdom of Saudi Arabia by Mahmoud A. Al-Shanti, John J. Pint, Abdulrahman J. Al-Juaid and Saeed A. Al-Amoudi, SGS-OF-2003-3, Saudi Geological Survey, Jeddah, Saudi Arabia, 2003, 32 p., 51 figs, 1 table, 2 apps. Preliminary Survey for Lava-Tube Caves on Harrat Kishb, Kingdom of Saudi Arabia by MJ Roobol, JJ Pint, MA Al-Shanti, AJ Al-Juaid, SA Al-Amoudi and S Pint, SGS-OF-2002-3, Saudi Geological Survey, Jeddah, Saudi Arabia, 2002, 35 pp. with 7 pp. appendices. WordPerfect Para Todos (WordPerfect for Everybody), the Basics of 5.1 Illustrated, by John J. Pint, Compart, 1990, 1991, 1992, 92 pp. ; reprinted 1993 by Editorial Patria, Mexico City. Telephone Talk, Passages for Aural Comprehension by John Pint, Pergamon Press, 1983 112 pp. (with cassette); republished 1988 by Prentice Hall International. Twentieth Century News, Passages for Aural Comprehension by John Pint, Pergamon Press, 1983 85 pp. (with cassette). The Adventures of Lucky Luke, Stories and Exercises to Develop Reading Comprehension and Vocabulary: stories by Morris & Goscinny, adapted and translated from the French by John Pint, Prentice Hall International 1986, Volume I and Volume II, each 60 pp. Encounter English, Beginning II of The Britannica Method by John Pint and Dale A. Enger, Encyclopaedia Britannica, Chicago, 1979, 447 pp. in four volumes with 828 microrecords . Reference Manual for Pimaview Version 2.5 by Integrated Spectronics, translated into Spanish by Susana and John Pint, Integrated Spectronics Pty, Ltd, Australia, 1997, 58 pp. The Dalton Brothers' Analyst by Morris & Goscinny, translated from the French by John J. Pint, Dargaud, New York and Paris, 1982, 46 pp. Subterráneo, Bilingual (Spanish and English) Speleological Bulletin for western Mexico (1988 to present) edited by John J. Pint. Prospects for Lava-Cave Studies in Harrat Khaybar, Saudi Arabia by John J. Pint, Proceedings of the X, XI, and XII International Symposia on Vulcanospeleology, AMCS, Austin, 2008, p. 197-200. Surveyed Lava Tubes of Jalisco, Mexico by John Pint, Sergi Gomez, Jesus Moreno and Susana Pint, Proceedings of the X, XI, and XII International Symposia on Vulcanospeleology, AMCS, Austin, 2008, p. 168-170. Vulcanospeleology in Saudi Arabia by John J. Pint, Acta Carsologica, 35/1, Ljubljana 2006, pp. 107-109. Searching for Lava Tubes in Arabia by John and Susy Pint, NATIONAL SPELEOLOGICAL SOCIETY NEWS, May 2005, pp. 9-15. The Caves of ‘Ar ‘Ar by John and Susy Pint, NATIONAL SPELEOLOGICAL SOCIETY NEWS, March 2004, pp. 68-73. Ghar Al Hibashi Lava Tube: The Richest Site in Saudi Arabia for Cave Minerals by Paolo Forti, Ermanno Galli, Antonio Rossi, John Pint and Susana Pint, Acta Carsologica 2004, 33/2 11 Ljubljana, pp 189-205. Saudi Arabia’s Underground Geologists by John Pint, AHLAN WASAHLAN MAGAZINE, March 2003, pp 6-10. Bats – What Would We Do Without Them? by Susana and John Pint, AHLAN WASAHLAN MAGAZINE, September, 2002, pp 12-16. The Caves of Habikah by John Pint, JOURNAL OF THE SAUDI ARABIAN NATURAL HISTORY SOCIETY, Vol 4, No 2, 2001, pp 22-29. Saudi Arabia's Desert Caves by John Pint, ARAMCO WORLD, March/April 2000, pp. 26-38. The Desert Cave Journal 1998-2000 by John J. Pint, NATIONAL SPELEOLOGICAL SOCIETY NEWS, October 2000, pp. 276-281. Old World Irrigation Technology in a New World Context: Qanats in Spanish Colonial Western Mexico by Christopher S. Beekman, Phil C. Weigand & John J. Pint, ANTIQUITY, Volume 73, Number 289, June 1999, pp. 440-446. Dharb Al Najem, A Visit to Saudi Arabia's Deepest Pit by John J. Pint, RISALAT AL-MA'AHAD Military Scientific and Cultural Magazine, Sep/Oct 1998, pp 2-4. Return to the Desert Caves of Saudi Arabia by John Pint, NATIONAL SPELEOLOGICAL SOCIETY NEWS, Nov. 1997, pp. 329-335. The Secrets of Dahl Shawiah AHLAN WASAHLAN MAGAZINE, October, 1998, pp 12-14. Caves Beneath Dunes RISALAT AL MA'AHAD MAGAZINE, Jan-Feb 1998. Dharb Al-Najem, A Visit to Saudi Arabia's Deepest Pit RISALAT AL MA'AHAD MAGAZINE, Jan-Feb 1998. The Caves of Ma'aqala by John Pint, THE DESERT RAMBLER (Riyadh Natural History Society), January 1995 (feature article) and Into the Teapot by John Pint, March 1995 (feature article)؟Documentos en Español? A Practical Keyboard for Typing Spanish, WORDPERFECT MAGAZINE, Sept. 1992, pp. 58-61; included on Disk of the Month. Who's This Rius? An Interview with the Father of Mexico's Graphic Documentary, THE COMICS JOURNAL, Sept. 1990, pp. 27-32. Riders of the Purple Page, ENGLISH TODAY #8, Oct. 1986, pp. 34-35. The Caves of Ma'aqala (cover article) NATIONAL SPELEOLOGICAL SOCIETY NEWS, Sept. 1985, pp. 227-282. Who Cares About Mexican Bats? NSS NEWS, March '94, pp. 94-97. Karst Landforms in the Kingdom of Saudi Arabia by Peters, Pint and Kremla, NATIONAL SPELEOLOGICAL SOCIETY BULLETIN, June 1990, pp. 21-32. Holistic Challenge to Student Creativity, EFL GAZETTE, Aug. 1985, p. 10. Publishing Your First Book, TEACHERS OF ENGLISH ARABIAN MONTHLY (TEAM) #42, 1982 pp. 21-32. Cartoons That Teach: How to Judge Their Use in ESL Textbooks, ENGLISH TEACHING FORUM, Oct. 1981, pp. 43-45. Book Review of Coast to Coast, MODERN LANGUAGE JOURNAL, April, 1979, p. 231. --- plus other articles in THE NSS NEWS, THE EXPLORER, and THE GUADALAJARA REPORTER. SAUDICAVES (www.saudicaves.com): articles on desert caves, dhubbs, the Red Sea, etc. MEXICO (www.ranchopint.com): articles on caves and other places of natural beauty in Western Mexico. 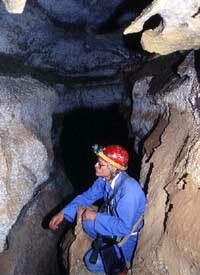 SUBTERRANEO (http://mx.geocities.com/zotz.guadalajara/): articles in English and Spanish on cave exploration in Western Mexico. Best Teacher Award, Monterrey Technological University (ITESM) Guadalajara campus. Presented by Director General, May 14, 1994.